This children’s book is definitely one of a kind. I have read a number of books where books are the main characters, but this story takes it a bit further. Obviously somewhat of a fantasy, the story revolves around the relationship between books and their readers. In particular, one young boy in the story is a magical reader, who can invoke the power and support of the books around him, to help others. 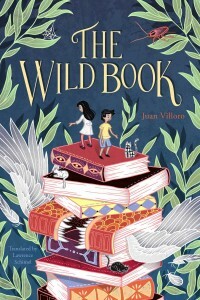 This is a real oversimplification of the story, but I can’t really capture the intricacies of this children’s book, except to say, it is a wonderful homage to books and reading, in the form of an adventure and real-life family problems. I think of similar children’s books, like A Week Without Tuesday, where again the books are a living force. However, the difference is that The Wild Book has a weightiness to it that others don’t have. It’s possible this is due to the translation, and choice of words used, when translating this from the original Spanish. But I think more likely, it is because it has more of a flavor of the author’s mythic culture from Mexico, rather than the light-weight Hollywood culture of America. It’s not that this children’s book is dark, but there is a darkness about it- for example, a lot of the action takes place in a room with no light. I liked reading this, and would recommend it for serious children who love reading and are willing to be with the book until the end. Obviously, it is also a wonderful children’s book for anyone of Mexican descent, as the author is well-known in his home country. Your email address will not be shared with anyone else. New book reviews are sent once a month. Click to view our newsletter archives.